ORDER ONCE. NO CONTRACTS. NO ROYALTIES. With our intuitive online ordering process, you'll quickly realize how simple it is to create your custom on-hold production. If it were any easier, it would be criminal. You'll be up and running with one of the best investments you can make in your business in no time flat. As always, there are no licensing fees and no additional costs. Fresh Voices. Great Music. Satisfaction Guaranteed! Did you know that 70% of callers are placed on hold, and that 60% of them hang up within 45 seconds? It's known that the best way to keep clients engaged while they're holding on the phone is to entertain them. That's what Amazing Voice can do for your business. If 88% of callers prefer on-hold messaging and music, why not exceed their expectations with our on-hold experience? Featuring our 'Amazing Voice' technology, we professionally record customized on-hold messages that fit your business and its customers. 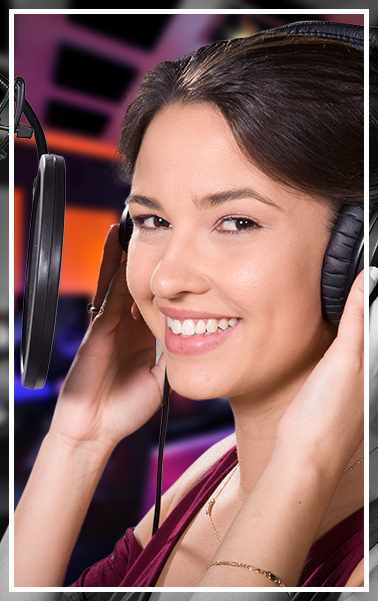 Using a stable of professional male and female voice talent and world-class audio engineers, we record your personalized script in any language of your choice. Increase your offers by up to 20% when mentioned on-hold. Cross-selling and upselling is a snap when you use on-hold marketing messages to promote additional services and other special offers while your customers wait. We also include other state-of-the-art audio production elements including original music, and much more. Our professionals craft the best on-hold experiences for your customers-exactly the way you want it! When you use Amazing Voice to produce an on-hold customer experience, our messages are proven to retain customers on-hold 30% longer, so you get the opportunity to serve them. These tailored on-hold experiences entice callers with an irresistible call-to-action that could make or break a potential sale. When your on-hold customer experience has a high production value, this makes a huge impression on your customers. It shows a high level of professionalism and builds trust with your callers. To increase caller retention, your on-hold customer experience will eliminate the need for a live person to answer incoming inquiries. The on-hold persona will relate any information including contact information, business hours and directions, company directory, and any other features you want to include. Your on-hold customer experience is also the perfect time to drive traffic to your website as well as build brand awareness to a captive audience.